2017 presented the Ohio Department of Transportation (ODOT) with the opportunity to improve one of the area's most valuable assets as the reconstruction and widening of Interstate 75 through Findlay and Hancock County began. The project began in March. “We accomplished what we hoped to in the first year of the project, even with weather setbacks, which included significant rainfall and flooding of some areas of Findlay and of the Interstate 75 project area,” said Kirk Slusher, ODOT District 1 deputy director. The most notable change for motorists is the new pavement they're driving on in the southbound direction. “In mid-December, we switched traffic onto new pavement in the southbound direction and eliminated the contraflow lane through much of the project for the winter,” said Slusher. Elimination of the contraflow lane, which crossed one lane of southbound traffic onto the northbound side, will aid ODOT maintenance crews in removing snow from the interstate. It also is necessary so that the next phase of interstate demolition can occur throughout the winter. The contraflow pattern on Interstate 75 southbound will continue through the winter from U.S. 68/state Route 15 to the Lima Avenue/county Road 313 overpass, he said. Below are some facts and stats that show the progress of the project's first year. • The reconstruction of the Harrison Street bridge is nearing completion and is anticipated to reopen to traffic early in 2018. 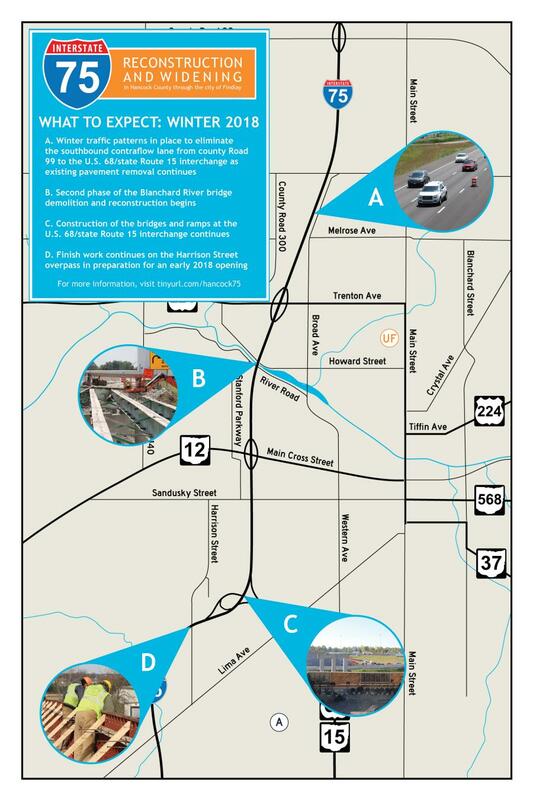 • The first phase of the reconstruction of the bridge on Interstate 75 over the Blanchard River is complete and is now supporting Interstate 75 southbound traffic. • The first phase of demolition of the bridge on Interstate 75 over the Norfolk Southern railroad is complete. • The southbound entrance and exit ramps at both the state Route 12 and U.S. 224 interchanges were reconstructed and reconfigured. • The installation of a sizeable water line on the west side of the interstate near the Blanchard River is complete. • Approximately 63 percent of the earth work on the project is complete with 628,000 cu. yds. of earth moved. • Approximately 45 percent of the foundation and post work for the noise walls is complete. It is anticipated that setting of wall panels will begin in February. • Approximately 35 percent of the existing pavement on Interstate 75 has been removed, which equates to about 84,000 sq. yds. In addition, the installation of a steel arch beneath Interstate 75 over an abandoned railroad bridge north of the Blanchard River was completed. The arch provides for the continued flow of water beneath the bridge to help alleviate the area's propensity to flood. Significant work also was completed on the new, reconfigured interchange at U.S. 68/state Route 15. The abutments for the new structure are nearing completion and some of the beams for the new flyover ramp are set. The flyover ramp will replace the existing and much maligned loop ramp and will connect Interstate 75 southbound traffic to U.S. 68/State Route 15 and Lima Avenue. Slusher said significant work will occur over the winter, when weather permits. Two lanes of traffic on Interstate 75 will continue to be maintained the majority of the time while construction continues. Some occasional nighttime closures will occur. The $113 million project reconstructs and widens approximately 5 mi. of Interstate 75 from just south of the Harrison Street overpass to the county Road 99 interchange north of Findlay. The project also includes the replacement of all mainline bridges on Interstate 75, replacement of the Harrison Street overpass, the redesign and reconstruction of the interchange between U.S. 68/state Route 15 and Interstate 75 and the redesign and reconstruction of the interchange with U.S. 68/state Route 15 at Lima Avenue. The entire reconstruction project is expected to be completed in August 2020. Beaver Excavating, Canton, serves as the general contractor on the project. The Ohio Department of Transportation maintains the state's largest man-made asset — the transportation system. ODOT's mission is to provide the safe and easy movement of people and goods from place to place. As a $2.8 billion per year enterprise, ODOT invests the bulk of its resources in system preservation through maintenance, construction and snow and ice operations.